What’s the best way to introduce a hamburger? Meat Patty! Our hard-working Polish mother, Alfreda, always cooked from scratch and made the best homemade hamburgers when we were growing up. She didn’t have the luxury of a $1,000 gas barbeque but grilled our burgers on an old-fashioned, rickety, beat-up charcoal barbecue that our dad had picked up at Canadian Tire. If you’re as fired up as we are that outdoor cooking (and summer!) 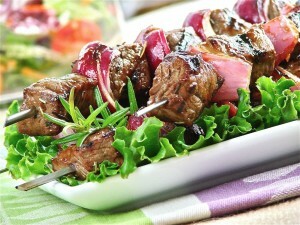 is finally here, you might appreciate these hot tips for healthifying the meat that you eat. Most people have heard that when you cook meat (whether it’s grilled, broiled or seared), some carcinogenic compounds called HCAs (heterocyclic amines) can form. Charring or burning meat at high temperatures can produce a higher concentration of HCAs, and may accelerate aging and disease over time. The more well-done, the more chance YOU’LL be well done! No need to chuck the ground chuck, though. Honest! There are plenty of ways you can counteract and/or drastically reduce the nasty compounds formed when barbecuing and still enjoy the occasional grilled meat. Happily Marinated: When you marinate meat in citrus or vinegar, or a rub containing rosemary, you reduce carcinogenic compounds formed during grilling. The spices thyme and oregano, like rosemary, also contain plenty of antioxidants that have been specifically cited in studies as being powerful inhibitors of HCAs. Plus, they taste great! Best Grill Friend: Adding garlic to meat or poultry also appears to reduce the production of cancer-causing chemicals that can develop in meat when it’s grilled at high temperatures. Stew Good to Be True: By the way, did you know that cooking meats in liquid, like you would when making soups and stews or using a crockpot, or using marinades, is the HEALTHIEST way to cook meat? Cooking meat in a water base has been shown to eliminate the problem of the HCAs. Marinate, braise, baste or stew. All are better for you! Skinful is Sinful: Always remove the skin from poultry and fish, not because it contains fat, but because that’s where most of the toxins accumulate. The same goes for trimming fat from meat. Fat is where a lot of toxic gunk is stored. Make Well-Done a Rare Occasion: Charring is SO not cool! We’ve never really understood why anyone would want to ruin a perfectly nice piece of meat by burning it at the steak. Rare, medium-rare or medium are healthier choices. But if you’re one of those rare individuals who enjoys well-done, make sure you load up on antioxidants to combat those extra carcinogens. Spices, teas, berries, colourful veggies and dark green salads and even supplemental antioxidants like resveratrol, acai or goji juice will protect you. Our bodies are very resilient if you give them a helping hand! Finally a FABULOUS Chicken Burger. I hope you continue to sell these Chicken Burgers. The taste is absolutely amazing, so amazing that I went back to Costco and bought six more boxes. I split them and put them in a freezer bag. Thank You Janet and Greta. P.S. I have all the Looneyspoons Collection and love them! Hi, what do you recommend as sides with your “Loafstyles of the rich and Famous”? Hi Janet and Greta, I was listening to CFRB this morning Saturday October 12 and you mentioned a wonderful sounding water drink. I missed today’s show on CTV news at noon but my husband caught the end of it when you were talking about blending butter with olive oil. Can you tell me why you would do that and how could I use it? I love butter but my husband insists on Becel light and I am sure it is not too good for our health. Love you show by the way…. Hi, My friend and I saw your talk last night at Centrepointe in Ottawa. It was very inspiring! Thank you! We were wondering what you think of canola oil? Also, any comments on stevia and xylitol as natural sweetners? Thank you very much!!! Hi Jessie. Thanks for coming to my speech! I do like stevia very much and think it’s a healthy sweetener for sure. I just chose not to talk about it simply because some people don’t enjoy the taste. Xylitol seems to be just fine as well. Canola, unfortunately, is now a genetically modified crop and seeds coming from Monsanto that are “Round-up Ready.” Not good! Plus, it’s in all the packaged foods, as I mentioned. It’s another Omega-6 fat that can trigger inflammation. I’m not a fan of it, and that’s why I didn’t even mention it. Hi I love cookbooks and cooking but never had the whole family on board with all recipes even sisters that is until now. We all love your loonyspoons collection. We all take turns in choosing the meals for the week each Saturday. I plan to buy my sisters sister in laws and sons girlfriend the book for Xmas. Keep the recipes coming we are all sold on them. A miracle to have the whole family on board and healthy to boot awesome. Thanks for your great testimonial, Elaine! We’re so glad you and your family are enjoying our book. Keep up the good eats! Hi, I am looking for a recipe from one of your books, it’s biscuits made with mashed potatoes, which sounds sooo good!. Ladies, Hubby and I love your shows, but frankly I never bought any of your cookbooks because I had CF and was having a hard time keeping weight on; my docs gave me a food regimen consisting of hi-fat and hi-caloric foods…cheese, peanut butter, McD’s, chips, chocolate bars, second helpings, snacks before bed…nothing off limits. I pigged out to try to maintain 116 lbs. at 5′ 7′. Last year I was sick and in hospital again with lung infections as I have been all my life. Finally, at the age of 53, with lungs working only 15%, and on oygen 24/7, I was listed for a double lung transplant, and was told the wait could be 8 – 12 months as I have a rarer blood type. God blessed me with the call 25 days later and I had brand new lungs and a new chance to live August 20, 2013. THANK YOU DONOR! With complications I spent a total of 117 days in hospital. What this all is leading up to is that I have gained 50 pounds since my life-saving surgery; I have NEVER had to DIET or worry about what | ate before! Plus I am still on 18 different meds totaling 47 pills daily; one being prednisone which keeps you puffy and hungry. A few weeks ago I happened across your J&G Gourmet Chicken Burgers with caramelized onions and swiss cheese in Costco. Hubby and I (who is a construction worker who was off 3 months to care for me post-surgery, and off another 3 months for a back injury and had gained weight as a result) absolutely LOVED the taste and texture of your product. My 81 yr old Mom asks me to make them for her often. We tell everyone how tender and juicy and flavourful they are. I especially enjoy them with tomato, lettuce and a spoonful of tszaziki on warmed buns. I will be searching out more products, and buying your cookbooks to help us eat healthier, and commit to getting more physical, now that I have the breath to! My lung function is up to 88%! God bless you both, dear Sisters. You deserve all the success for your awesome teamwork and passion to help us all be healthier! Thank you so much for writing to us! Your story is incredible, and we’re so happy to hear that you’re doing so well after your major surgery. Wow! The chicken burgers are very popular. It’s great to hear your hubby and mother both like them. If you can look for our Looneyspoons Collection cookbook, I guarantee it’ll really help your family a lot. There are a ton of super-scrumptious, everyday recipes with common ingredients–all healthy! Plus plenty of corny jokes and humor. If you like our TV show, you’ll love the book. I promise! We all know that laughing burns calories. We like to say that more giggling leads to less jiggling! Wishing you the best health ever!